Racketball is very similar to squash but played with a bigger racket and ball. 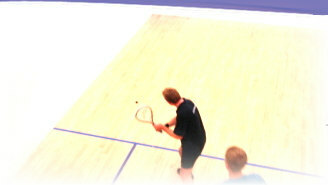 The game is less strenuous on the joints than squash, although rallies can be quite a bit longer. Racketball has certainly prolonged life on court for a number of injured or older ex-squash players. Because the ball and the racket are bigger, racketball is easier to pick up than squash and very soon long rallies can be achieved by most players. And because the ball is bigger it does not hurt as much if you are unfortunate enough to get in the way of a well struck ball. Click here for further information on the rules of racketball.